Hello all and welcome back!! I know I haven't posted in a while but I have been busy with university and sorting out a few projects that will be coming soon ☀︎ Yay ☀︎ Anyways, I have decided to do a post on a few outfits that could be worn to festivals, as it is coming up to that season. I have a festival coming up in the next 2 weeks and I thought that this would be a perfect time to post this! I hope you all enjoy!! I think there's always a few girls who go this route. This is such a girly outfit! Definitely a stand out outfit from the rest of the crowd. The clothes are super simple so you would most likely to find these things in your closet, and mix and match to your own desire!! And it creates such a pretty mix of colours. This is Gigi Hadid inspired from her 2015 Coachella outfit. Instead of the black underneath I went for the white and denim shorts just so it would be a bit more softer and more wearable. I love this outfit because it is so simple and comfy yet, it looks like a lot of effort has been put into it! For this outfit, I wanted to do something a bit more different. I wanted more warmer colours but something that was a LOT out of my comfort zone. I think this outfit turned out so well and many people would go for this type of outfit for larger festivals. I love how many layers are to this outfit and which makes it a bit more interesting! 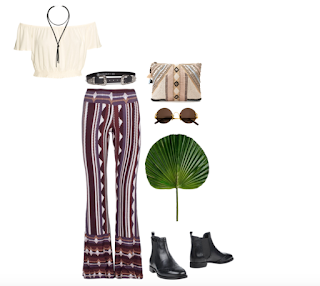 This is inspired by Vanessa Hudgens Coachella look this year (2016). 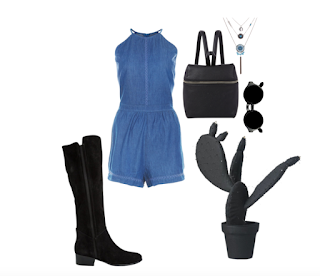 I love this because rompers make you look like you have put so much effort into your outfit when you haven't really. I love the pattern on this one and I think it would be a gorgeous contrast while your out and about in the festival. Did I mention rompers are super comfy?! I know there are a load of girls, who are like me, and usually stick to some sort of black in outfits. So why not make the whole outfit black?? I think this outfit brings such an edgy vibe rather than your typical festival outfit. 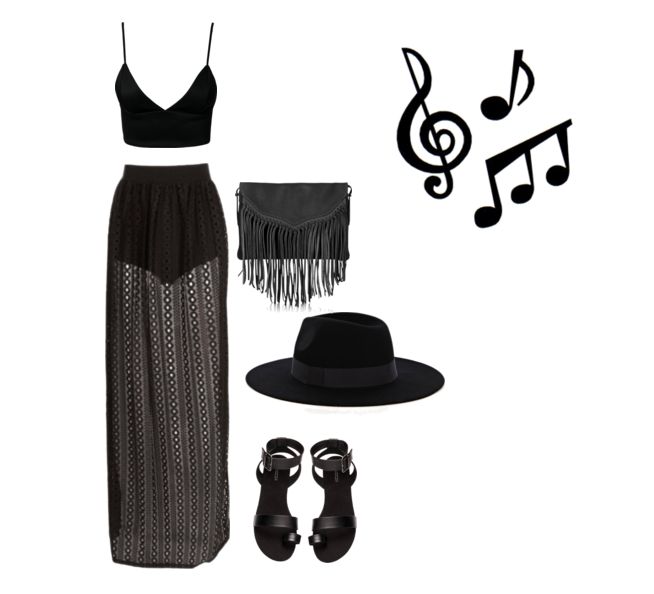 But this outfit also brings statement festival pieces like the wide brimmed hat, fringed bag, laced skirt and sandals. I really wanted to incorporate some long black knee high boots into an outfit. Boots are always a staple piece at festivals, but I mainly wanted to make the boots stand out. I love the contrast between the blue denim playsuit and the black accessories, sticking to minimal colours is always a good idea if you're unsure what to wear. Recently I have been living for the label Camilla. Oml, it is so beautiful and every time I see a piece from them, it screams summer. I love this body suit, it is so bright and colourful but also a little risky with the low cut front. I think paring this with a dark denim skirt or shorts would be a pretty combo for the festival season. And here, I've just added a few pieces of jewellery to spice it up a bit. This is one of the first outfits I put together!! And yes. I'm in love. I love the whole vibe this outfit is portraying. This would be such a perfect comfy outfit for the day at a festival. I love the patterns in the pants and clutch bag. I wish I could rock this!! I love this lilac colour. Actually I love this outfit too! I love the simple but not - to - overboard lilac colour mixed with the black. I was actually going to include a patterned purple skirt but I loved how the top and skirt contrasted each other. I love how this outfit is so simple but it is such a pretty outfit. And the shoes, I literally want in my closet ASAP!! 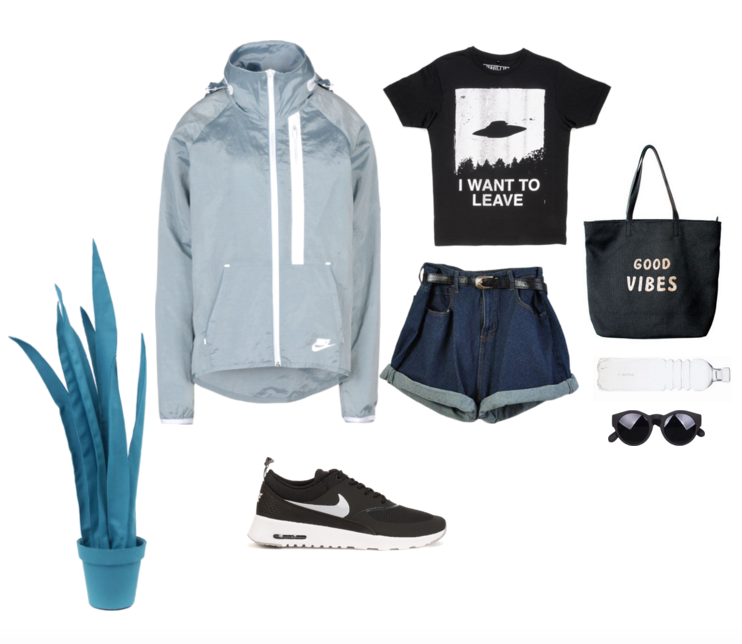 This for those rainy festival days. I wanted to include a more sporty look with a larger jacket into one of these outfits. I think the pale blue jacket is an amazing combination with the black. The jacket is of course optional but I know there are a few festivals that there's been rain or it has been freezing cold so, there is always an option like this!! I love this outfit. We all have that one friend at festivals who wears the most basic outfit and glitters themselves up with glitter and sparkles and flash tattoos!! I love how simple but elegant this is and all the items are super re-wearable. I also added a few hair bands to add into the sachet because how many times have people forgotten hair bands?! And also, because fairies give things people need. This is my personal favourite and that is why it has been left until last. It has everything in it that I would associate with festivals, the fringe, the lace, and boots. I think this would be super wearable and its such a statement outfit. P.S. One day I will build up the confidence and money to wear and buy this groovy outfit. Thank you all so much for reading, and I hope you were able to find a few outfit inspirations on here!! Make sure to tell me which outfit was your favourite below! !